Habit: Perennial herb 15--60 cm. Stem: ascending, stiff-hairy, not glandular. Leaf: mostly basal; blade 100--250 mm, > petiole, lanceolate to oblanceolate; basal dissected, segments 7--11(15), veins of basal leaves prominent; cauline generally entire. Flower: calyx lobes 4--6 mm, 8--12 mm in fruit, linear to oblanceolate; corolla 5--9 mm, bell-shaped, white to cream, limb 4--8 mm diam, scales fused to filament bases, oblong; stamens 9--14 mm, hairy; style 9--15 mm, cleft 1/2, glabrous. Fruit: +- 3 mm, ovoid, stiff-hairy. Seed: 1--2, 2.5--3 mm, pitted in +- longitudinal rows. Chromosomes: n=22. Ecology: Slopes, streambanks, flats, chaparral, woodland; Elevation: 50--2500 m. Bioregional Distribution: NW (exc NCo), CaR, SN, GV, CW (exc CCo), WTR, SnGb. Flowering Time: Apr--Aug Note: Intergrades with Phacelia imbricata (especially in SnFrB), Phacelia corymbosa, Phacelia hastata. Some plants in NCoR mat-forming. 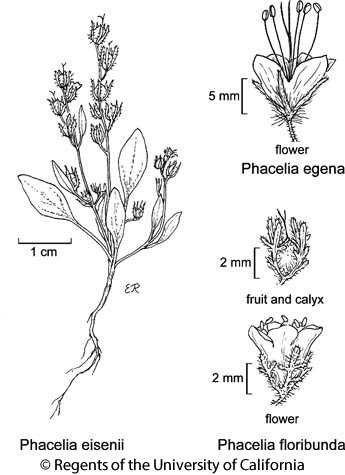 Citation for this treatment: Genevieve K. Walden, Robert Patterson, Laura M. Garrison & Debra R. Hansen 2013, Phacelia egena, in Jepson Flora Project (eds.) Jepson eFlora, Revision 1, http://ucjeps.berkeley.edu/eflora/eflora_display.php?tid=37455, accessed on April 26, 2019. NW (exc NCo), CaR, SN, GV, CW (exc CCo), WTR, SnGb. Markers link to CCH specimen records. Yellow markers indicate records that may provide evidence for eFlora range revision or may have georeferencing or identification issues. Purple markers indicate specimens collected from a garden, greenhouse, or other non-wild location.